In 1994, while back in Germany helping to care for her mother after hip surgery, Malcom called and said "Guess what I am doing?" As it turns out, he was pollinating everything in the garden and at that time they had already amassed a sizable collection from other hybridizers. After returning to Ohio, Gerda jumped on the bandwagon too. “All in all we were a team but did our separate thing. 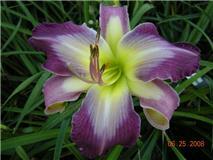 We would ask each other questions and share out thoughts, and tried to be the first one out in the garden at hybridizing time to make a cross on that last bloom of a particular daylily. My husband always beat me to it. I accused him of going out at 3 in the morning with a flashlight, prying open a bloom to set pollen on it. We both laughed about that. I have heard it said a few times that my husband would have been one of the greatest hybridizers around, and I believe it, too.” This was the beginning of Victorian Gardens. She credits four outstanding hybridizers as being the biggest inspirations and mentors, but there are so many more. First is Steve Moldovan, he offered immediate encouragement, praising Gerda’s eye for color and detail. She says it was Steve that taught her those things to begin with. “He would bring me to a seedling and say "Look at this, there is so much going on in this flower" He would point to the eye, the nuances of colors, and all the intricate details in the pleating and ruffles etc.I still do this to this day.” David Kirchoff is a charming and intelligent man and his advice for the Brookers is “IT IS DAYLILIES, ENJOY AND DON'T FRET!” You can’t mention The David and not mention Mort Morss in the same breath. 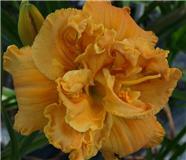 How can you not like someone who names a daylily after you? 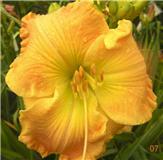 “I do see Mort as much of the backbone of Daylily World and both their talents combined make it what it is. 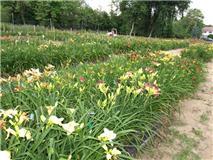 A great place to visit, and some of the most wonderful daylilies.” Mike Holmes, he knows so much about daylilies because he talks to everybody and retains the important facts. His enthusiasm will get you going every time. 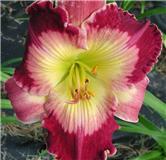 Larry Grace lends his keen business sense, loyalty and work ethic and his great hybridizing talents. These days, Gerda is breeding more for eye patterns with teeth. 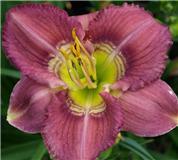 “When I see the daylily bloom at actual bloom time, all my plans from the previous day might go out the window.” Keeping her breeding program in mind, she uses only the best (in her opinion) eye patterns, color clarity and plant habit she can get her hands on. “After many mistakes, I have learned Great x Great does not always produce Great. 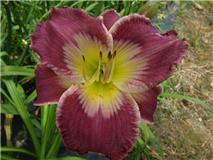 So it is what they call, luck of the draw.” While she breeds for bigger and better, but still likes to keep the excitement of hybridizing alive at bloom time, sometimes the surprises are better than the expectations. She tries to use fresh pollen, but as always sometimes has to rely on frozen pollen. Pollen is collected and stored in the freezer the same day. All seedlings receive a number when selected for evaluation and are transplanted to a separate ‘keepers’ bed. All beds are numbered and have six rows each. The rows are listed A-F and Gerda maintains and inventory list. If a selected seedling remains selected after three years, it is eventually lined out and increased for registration and eventual sale, depending on the rate of increase. Gerda lists deer as the biggest challenge faced in her display garden. Liquid fence just make the deer laugh and they ask for their daylilies with a little bit of hot sauce to bring out the flavor. The location is good for visitors, so the deer are tolerated…poorly. Seedlings, however, are grown on a piece of family property a few miles away that is surrounded by electric fencing. The gardens and seedlings are a bit much for just one or two people to deal with on their own and Gerda mentions two outstanding paid employees, but there are also the grandchildren who come to help with shipping and weeding, among others. Michael Bennett, who worked there for ten years, until Gerda pushed him on to bigger and better. 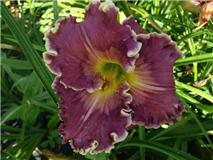 A fellow daylily lover, Mercy Ermakov, shows up when needed despite her own busy family life. Beauty is in the eye of the beholder when it comes to registering seedlings. 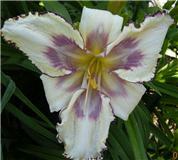 While beauty is important, so is plant habit, branching, height and bud count. 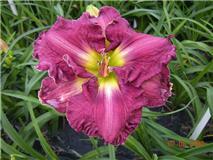 “I have seen a lot of changing trends in everybody’s hybridizing programs. 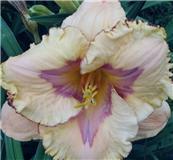 It is a fashion show to me and mostly the newest fashions are the most popular, with some of us still appreciating some of the outstanding oldies.” Gerda says the AHS is running things very well, providing all daylilies with recognition. 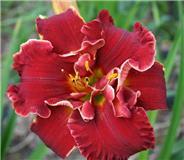 Who could have guessed that growing up on a 180 acre Aberdeen Angus Cattle farm in Iowa would be inspiration for creating some of the most beautiful, but lesser known daylilies on the market. Judy (Davi) Davisson grew up on said farm, with her parents and three sisters. The family also raised soy beans, chickens, oats and vegetables. The property was originally owned by her grandparents. 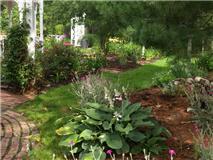 Judy’s grandmother started the one acre flower garden surrounding the house. She grew peonies and roses, lilacs and every other perennial she could get her hands on, including H. Evelyn Claar (Krausse 1949) which she bought when it was the latest and greatest. 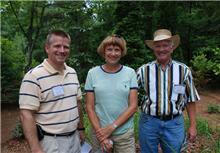 Glenn, Judy’s husband, was raised on a very similar family farm, growing oats, corn, dairy cattle and three boys. Davi earned her BA from the University of Northern Iowa and did her post graduate at the University of Illinois, where Glenn earned his degree also. Not long after, Glenn got a job with General Motors and the couple moved to Michigan. Davi worked as an accountant and taught accounting systems to businesses while raising their one son, Adam. Adam now lives near Savannah, GA as an Engineer with his wife Abby and their two year old son Michael. Six years ago, Glenn and Judy made the decision to retire to North Carolina, so they sold off the house and furniture so they could haul the entire garden with them. At least they had their priorities straight. “My main goal is to create extra- large flowers with fancy faces and interesting shapes on extra tall, well-branched scapes with stellar, northern hardy plants under them. I love appliques, watermarks, bitones, clean colors, and fragrance.... and like to combine these. I also have a line of tet miniatures that are sculptural that I will continue to develop.” With daylilies in general, Judy would like to see more originality. She feels that there are too many new directions that have yet to be explored for copycats to be introduced. “All it takes is creative thinking, focus, and the patience to carry it through many generations of line breeding.” Judy credits 3 hybridizers with being her mentors and biggest inspirations. 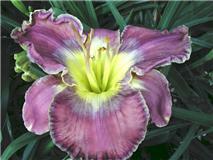 Howard Hite helped her to gain the know how to develop plants that didn’t even exist at the time. Tetraploid, unusual forms with plenty of motion were hard to come by then, without using any diploid conversions that is. Next she mentioned Al Goldner who inspired her to work on creating carefree, disease free plants with self cleaning habits. 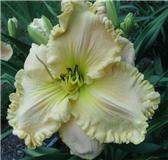 Hardiness and tall sturdy scapes are also important. 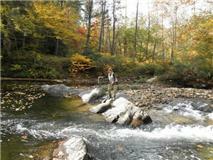 Curt Hanson rounds out the trio, he taught her to do what makes her happy instead of following the pack. 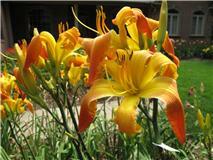 Curt was also very generous with his plants and he lends more inspiration year after year. When actually deciding what crosses to make, she studies each plant, trying to determine what could be done to make it more unique. She never makes a cross unless she has a specific goal in mind with that particular plant or flower. This is some advice I should take myself, but I can’t seem to let a flower go unpollinated. 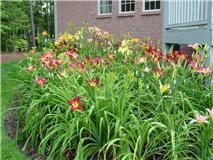 In the 30 years she has been growing daylilies and hybridizing, she’s tried a variety of methods for storing pollen. Fresh pollen dried in the house under air conditioning is the best, but Judy also uses frozen pollen, stored in gel caps or centriguge tubes. For 2011, she’ll be trying out the matchbox storage method. You just have to find what works for you. Long crosses are marked with wires or colored paper clips, but bread tags are used for short crosses and hanging tags if supplies of the others run out. Seeds are stored in paper coin envelopes in large plastic jars with lids in the refrigerator, leaving little room for food. She usually starts between 1,500 and 6,000 seeds every year, with maybe 50 of them reaching evaluation status.